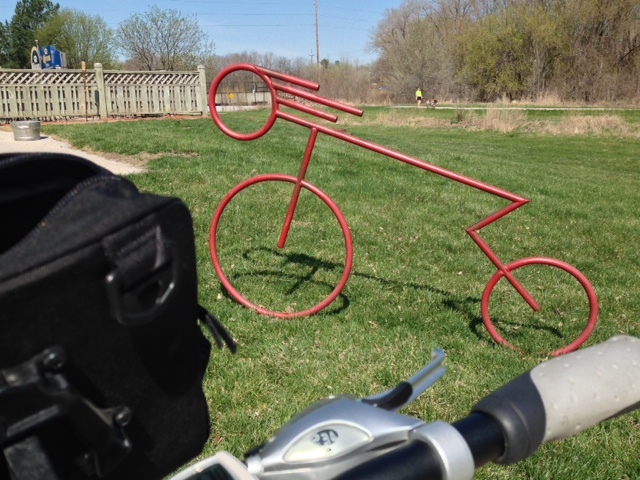 West Des Moines has a new outdoor art installation. It's called Surrounds and is found in five locations along the Jordan Creek Trail. Earlier in the year residents voted for the native animals to be included. The winners were fox, beaver, squirrel, rabbit, hawk, and owl. On my ride to find the brightly colored critters. I discovered the bridge just east of the I35 closed. The sign posted was backwards indicating a slippery trail instead of a closed bridge. I took the liberty of turning it over. The detour options are to either return to Prairie View Drive and use the southern sidewalk along EP True or to ride the grassy field through Jordan Creek Park. I chose the field. To avoid spoilers I didn't take a picture of all animals. And, I won't mention where they are all are in the event you want to go on your own hunt. But, if you don't like surprises or want to make sure they're all found, visit the city of West Des Moines website for locations. West Des Moines, You're Lucky! 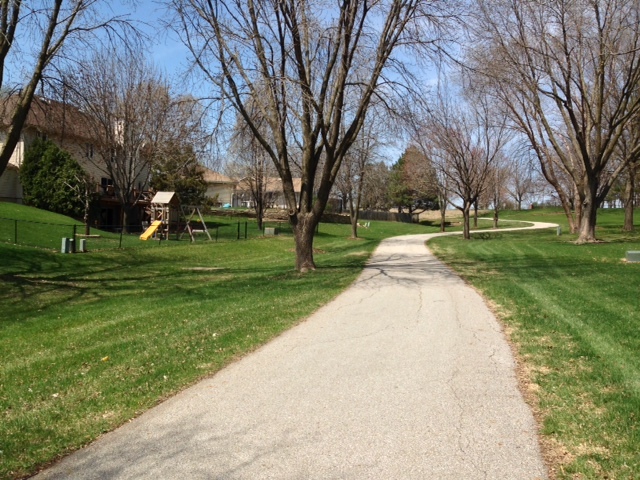 Linking West Des Moines to the metro's central trail hub, Jordan Creek travels east to west through parkland, industrial areas, and along city streets. Named after it's respective creek, this asphalt and concrete trail can be accessed at several city parks and businesses. Ah, how I envy residents of West Des Moines. 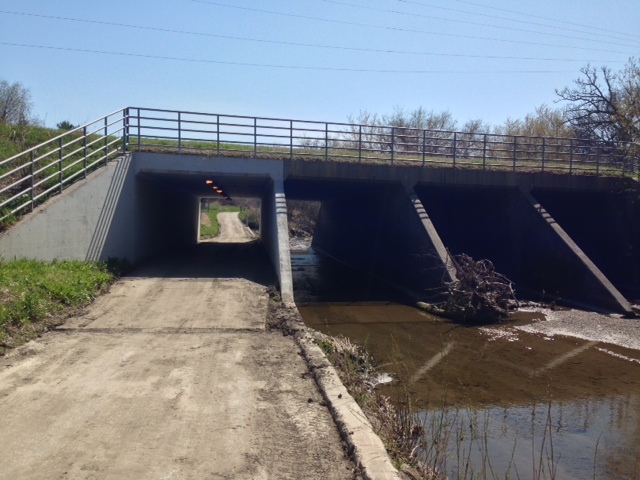 Especially those with close access to the Jordan Creek Trail. Why? They can get practically anywhere by bike (church, movie theater, groceries, restaurants, retail, school, and the library) with limited time (if any) on city streets. 1. I didn't have to get off the trail at all other than navigating through a parking lot. 2. The bike rack was easy to find with no parking hassles. 3. Thanks to the limited amount of space for transporting purchases, I ended up spending way less than I usually do. 4. I saw a ginormous dandelion waiting to loose it's seeds. I would have not been able to see this piece of whimsical art had I been in the car. 5. 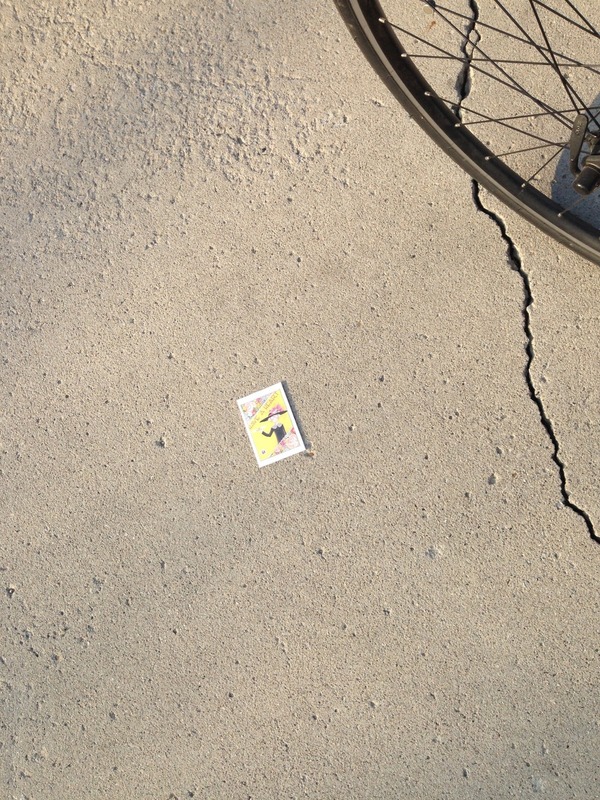 On the ride back I found the spoke card I had lost. Whew! 6. I found another Little Free Library, which is always fun. West DesMoines , you're lucky! Not every city in Iowa has a trail system to help you easily "get there by bike". And, for those of us who enjoy visiting for shopping or other activities, consider taking your bike to use to get around while there. 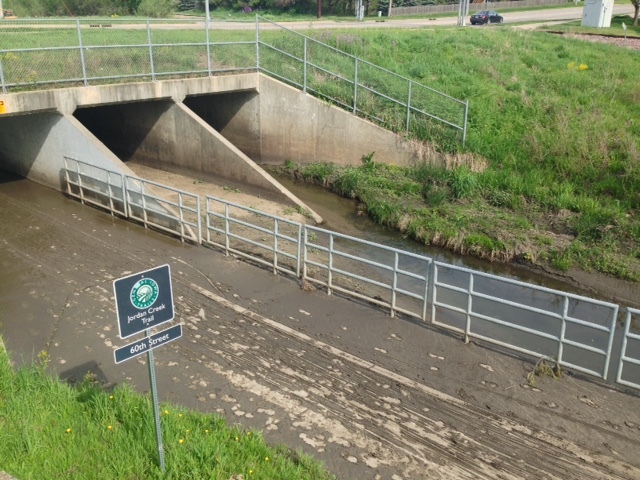 Linking West Des Moines to the metro's central trail hub Jordan Creek travels through a variety of areas ranging from parkland, industrial areas, and along city streets. Named after it's respective creek, this asphalt and concrete trail can be accessed at several city parks and businesses. A portion of this trail had been closed for years and hearing it was open I set out to see for myself. 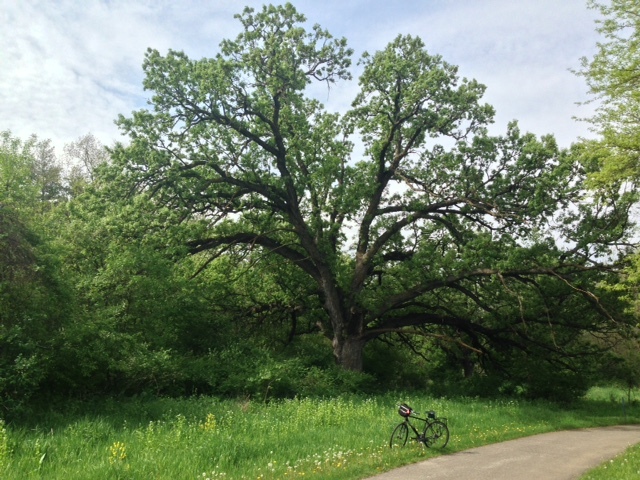 My ride began at Jordan Creek Park. There's no facilities at this location but it's super handy for hopping onto the trail. 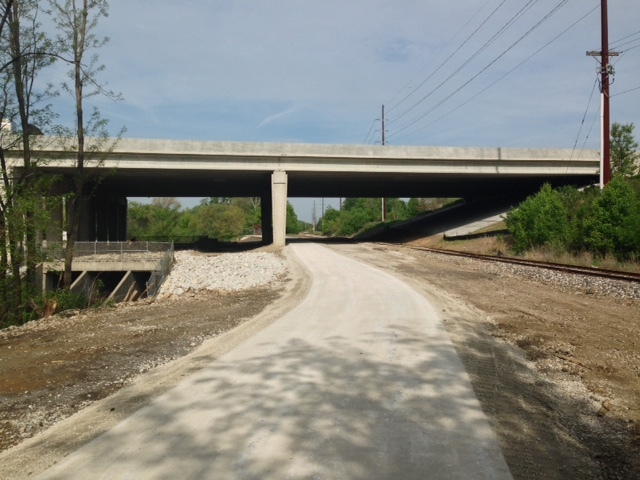 I headed west to check out the newly reopened segment of trail. 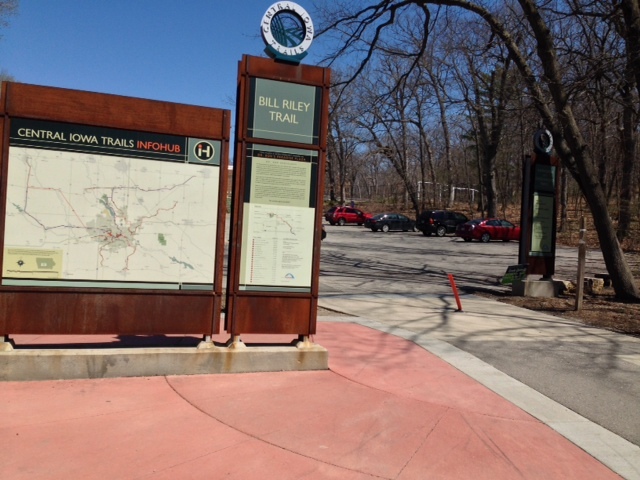 Barricades had been parted allowing trail users to make their way through. All was quiet in the former construction zone and the project looked complete despite a menagerie of construction materials waiting to be cleaned up. Between trail closures and mud/water/ice in various tunnels, riding the Jordan Creek trail can sometimes be problematic. I chose not to venture further west after finding the trail approach of the 60th street tunnel covered in inches of mud. Tough mudder I'm not! 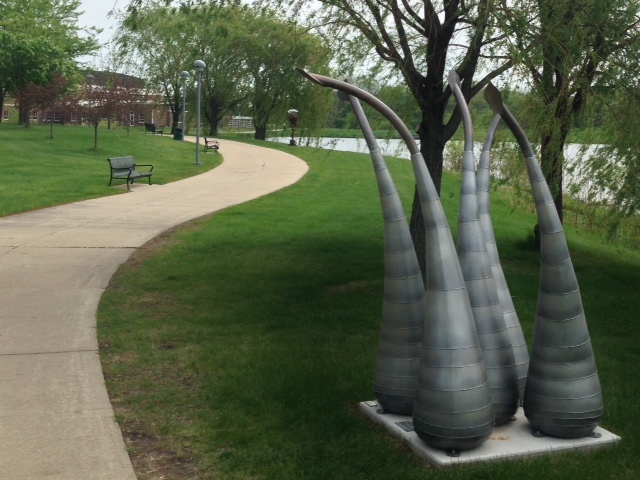 Art on the Campus had opened by the West Des Moines Library and City Hall area. 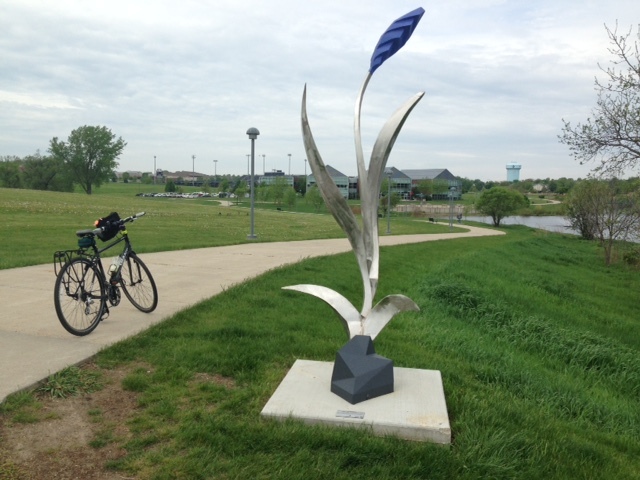 I pedaled over and got some culture by checking out the 13 sculptures created by Iowa artists. My favorite was Prairie Tamer by Daniel Perry of Waterloo. It reminded me of a weather vein and Iowa's windy days. The art installment will be on display through the fall with each sculpture for sale. After admiring the art I headed back towards the car but not without stopping at Timbuktuu Coffee Bar for a smoothie. 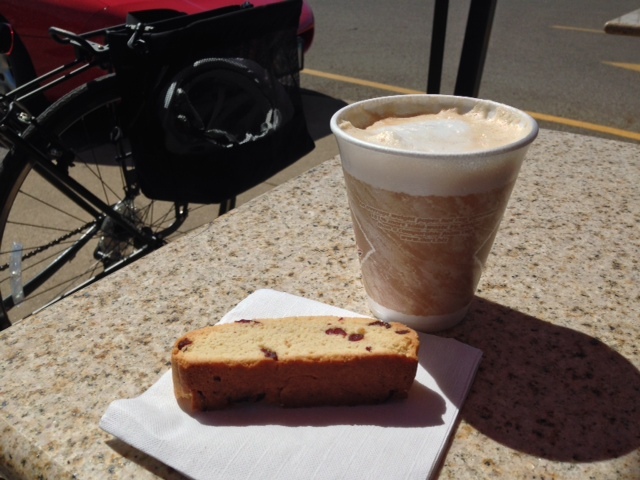 With a bike ride, some culture, and a healthy treat my day was off to a great start. Starting Point: Fishing dock east of the parks entrance. A beautiful sunny day with temperatures in the 40’s called for being outside and going on a bike ride in the snow at Raccoon River Park. My son came along and brought The Clunker to ride. We were curious to see if we would be able to ride the nature path surrounding Blue Heron lake. Would it be too snowy? Yes! 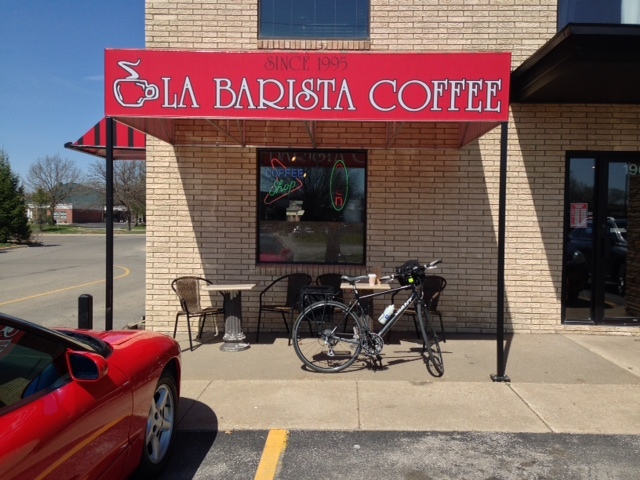 After pedaling less than ¼ of a mile we ditched the bikes. It was such slow going, and teeth-rattling bumpy. A small path had been packed in the snow by walkers and snow skiers, but wasn’t packed enough for our bikes. We said ‘see ya’ to our bikes and went for a hike before heading back to the snow-free asphalt trail. Once we reached the asphalt trail we rode through the park and then headed north on the Jordan Creek trail for a bit. We decided to turn around where the trail meets Fuller Road. Apparently riding The Clunker while wearing your snow gear makes you reeeelieeeeeeee tired! 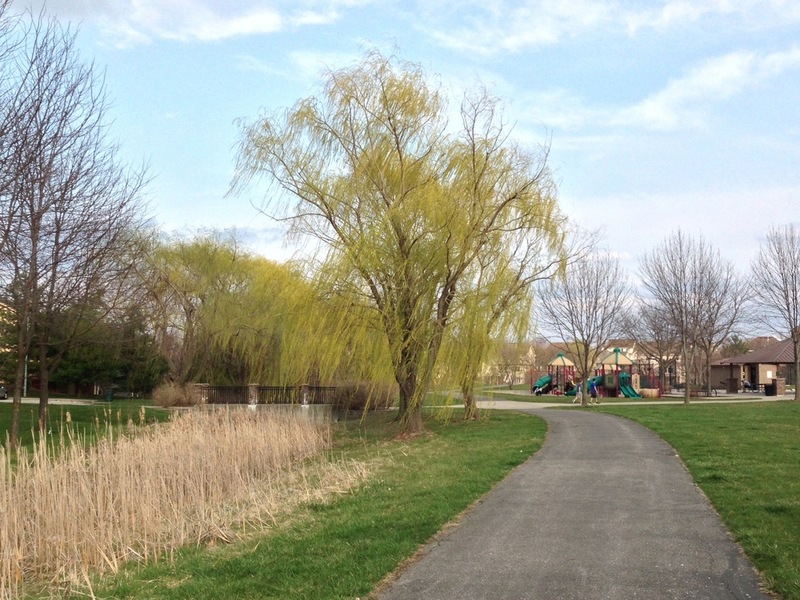 This is a great spot for taking kids out for a bike ride since there is no traffic to worry about. With the awesome playground, beach, nature lodge, and fishing pier, there are several opportunities to have fun...even in the snow! After unpacking our bikes we headed off towards the trail, but first took a detour to the boat ramp where we saw footprints in the snow of an ice fisherman and the track of his sled. We spotted him out on the ice once we rode back past the fishing pier. He was just getting set up for a day of fishing. On our hike along Blue Heron we noticed how low the water line was. We were able to walk out on the sand to a little island that normally is surrounded by water. Deer had made the trip out there as well. Perhaps they go to the little island to sleep at night. No stops on this ride except for helping my travel companion off the ground after falling off his bike collapsing into the snow. Some hot cocoa and granola bars were waiting for us in the car for a post-ride treat. We opened the tailgate for a spot to sit and talk while sipping our cocoa complete with whipped cream. Even though riding the nature trail didn’t pan out, we had a great time getting out in the sun and the snow on a warm winter day. Little adventures like this do a good job of fighting off cabin fever and make wintertime less daunting. We will be sure to return this spring to loop Blue Heron.